Charles Thomas Burt (1823-1902) was a Midlands landscape painter. He was born in Wolverhampton and lived in Birmingham most of his life. 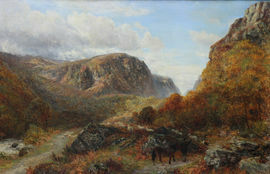 He was a pupil of Samuel Lines of Birmingham and also a friend and pupil of David Cox (q.v. ), by whose style he was influenced. Burt exhibited 16 paintings at the Royal Academy from 1850 to 1892, as well as the British Institute, Suffolk Street and elsewhere. He was a member of the Birmingham Society of Artists. 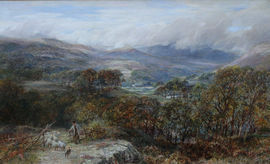 Burt painted Highland, Farming scenes and Moorland landscapes including Snowdon, Devon, Somerset, Malvern, Yorkshire, Derbyshire and the Orkney Islands.